Last week, we presented our 25 Most Devoted Fan Bases, in which we named the fandoms that weren’t necessarily the biggest, but definitely the most diehard. (Game of Thrones topped our list, narrowly beating Star Wars.) In this feature, we also turned to the fans themselves, asking them to write down their most fanatical stories in our comments section. With 311 comments (maybe an intentional move by 311 fans to get acknowledgement? ), there were plenty tales of devotion but a few fan bases did stand out. Read on for their tales of love in action: You’ll agree that their superfan credentials are in order. 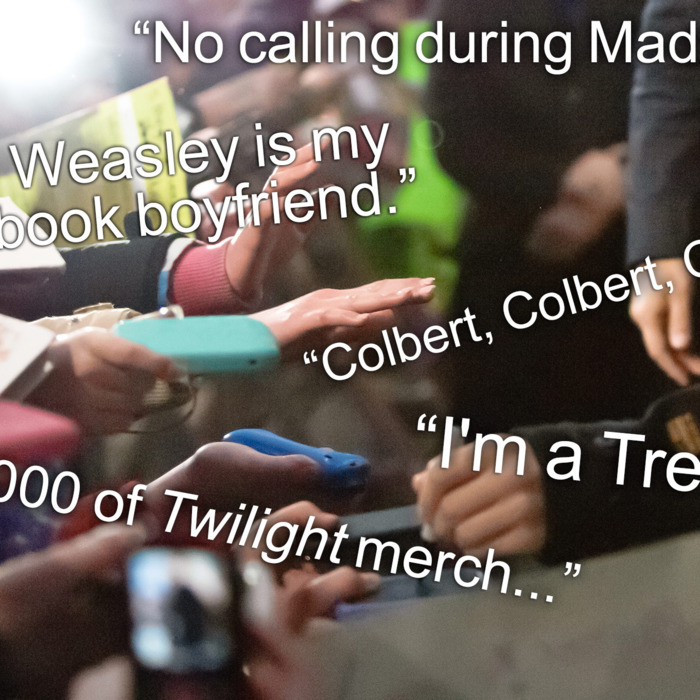 Not to be outdone, Twilight fans also wanted to share their love. And no one shared more love than TWI_HEART44. First, she sees the movies early and often: “My local movie theatre knows me as the Twilight girl cos i went 16 times to see New Moon, 8 times for Eclipse, 18 Times for [Breaking Dawn, Part 1].” Not only did she spend her savings to fly to Australia just to see Kristen Stewart at a premiere of a non­-Twilight movie, Snow White and the Huntsman, but she estimated she has spent more than $15,000 on Twilight stuff: “My collection, or shrine if you want to call it that.” Some of her payments went to the gold ring she had engraved with “Robsten Is Unbroken” and getting K-Stew to sign her hand and then have it tattooed. We also got some submissions from fans of shows/movies/authors not on the list. YH54 made a compelling case for Bronies and how it’s rare for a fan base not to be in the target demographic of the people creating the art. And PREPPYINPINK365 told us of how Gossip Girl thoroughly shaped her New York life, from where she moved postcollege (Upper East Side) to what goes on her head (dozens of Jennifer Behr headbands that would make Blair proud). It’s no surprise that there are plenty more great stories in the comments. Trust us: Check out the full posts from these people and marvel at the dedication. And if you need something to do with an extra $15,000, we have a Twilight fan who’d probably be interested.